Text: A History of Western Music. Grout, Donald J., Claude V. Palisca, J. Peter Burkholder. W. W. Norton & Company; Seventh Edition edition (2006). Will the music that is produced today still exist five hundred or a thousand years from now? If so, how will it be preserved? Will the medium and knowledge of how to perform it still exist? Will anyone then understand the meaning or cultural context of this music? If future generations are able to recover today’s music what insights, if any, would it reveal about the performance of this music and the society that produced it in 2011? Ever since Felix Mendelssohn “rediscovered” and organized a performance of Bach’s St. Mathew Passion over a hundred and eighty years ago musicians and scholars have been asking these same questions about what we today call “early music,” the music of the Middle Ages, Renaissance, and Baroque. 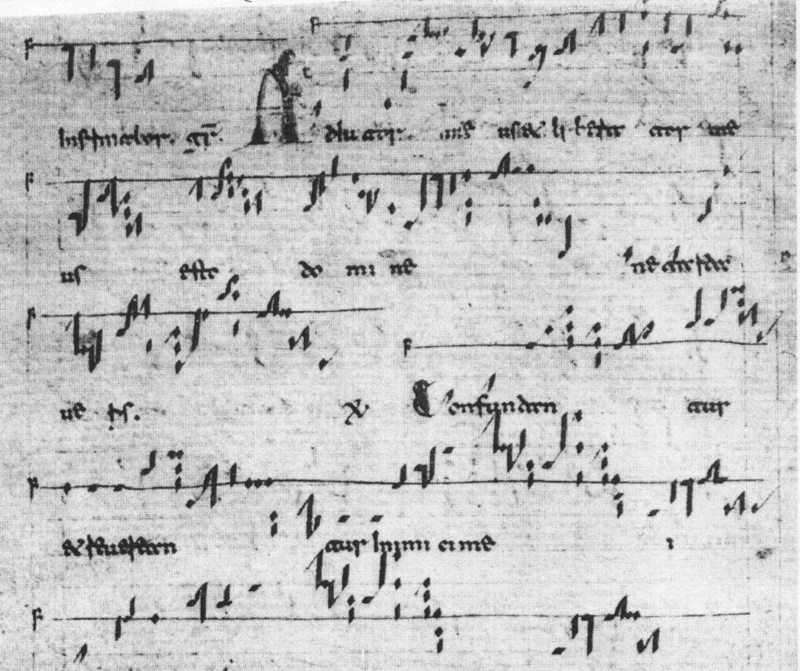 In this course on Music of the Middle Ages you will be able to discover not only what scholars have learned about the music and culture of this time but also some of the reasoning behind this scholarship. You will find that there are many gaps in our knowledge about what has been transmitted and that much is left to interpretation. Nevertheless, you will gain an essential understanding of how the music of this period became part of the foundation of the western art music tradition. During this process you may find that you are becoming more open and sensitive to the different aesthetic concepts and ideas in medieval music, and that you are developing an awareness and understanding of how these aesthetic differences reflect culture, time, place, and environment. Midterm examination 25%; Final examination 25%; Two listening tests 20%; Quizzes 20%; Writing assignments 10%. What regions of the ancient world has music been preserved? What kind of notation was used to record this music? Was this music vocal or instrumental? If instruments were used what type were they? What do we know about the social uses of music in ancient Greece? What do we know about the performance of this music? Describe what is meant by “ethos” of music in Greek thought. Explain how the philosophy of ethos could or could not be used to describe contemporary music. Class activities. Discussion of questions: show images of various ancient instruments that correspond to those in the text and ask to identify their type and origin; play excerpt of a performance of ancient Greek fragment and ask students if it matches the mood or meaning of the text; give practice quiz on class learning objects; provide feedback on the results. What were the major factors that led to the division of the early church? Where were the centers of the earliest Christian liturgies located? What musical forms and singing styles from the Judaic heritage did the early Christians appropriate? Who was Charlemagne? What was his major achievement in regard to the Christian liturgy? What are the two main components of Gregorian chant? What are some of the types of earliest sources of chant and what types of content do they contain? (hint: liturgical ‘books’). From what time period do the earliest types of music notations derive? Describe three general types of earliest chant notation notation. How do we believe the very earliest music notions were used? What does this tell us about how this music was transmitted prior to the advent of musical notation? Class activities. Discussion of questions: ask students to describe the differences between antiphonal and responsorial singing styles; show images of liturgical manuscripts and ask students to explain the different liturgical forms that they contained; show image of Pope Gregory the Great “composing” the liturgy: how does this myth compare with the reality of the development of ‘Gregorian’ chant? Why do you think this myth was propagated or so long? give practice quiz on class learning objects; provide feedback on the results. Plagiarism is academic dishonesty. It consists of misrepresenting the work of others as your own. Copying per se is ethically neutral—provided you acknowledge your source—but claiming credit for work that you did not do, for thoughts that you did not think, and for wording that is not the product of your own invention is an offense against everything that the university stands for. By all means, discuss the course’s subject matter and assignments with one another, but when you actually create the assigned documents, be sure that they are the product of your own independent thought and in your own words. Penalties for plagiarism range from earning an F on the assignment to dismissal from the university. The university rules, including the Student Code of Conduct, and other documented policies of the department, college, and university related to academic integrity will be enforced. Violations of these regulations, including acts of plagiarism or cheating, will be dealt with on an individual basis according to the severity of the misconduct. Sanctions range from receiving a zero for the specific assessment involved to failure for the course. See http://www.uc.edu/conduct.html for the university’s Student Code of Conduct policy. Attendance will not be taken directly, but in-class activities, class discussion, and quizzes are an integral part of the course. Students who do not attend class regularly tend to not do well in this course. Course materials and important communication and information will be regularly posted outside of class at http://blackboard.uc.edu/. Make sure that your correct email address is registered with blackboard.